If you’re interested in 4K gaming, you’ll almost certainly be reading several Xbox One X reviews today. They’ll all tell you the same thing: the hardware is great but it’s far too expensive, and the games library can’t match that available to the Sony PS4 Pro. I’m not going to offer an alternative view, but I’m also not going to slate the console for that reason alone. There are still plenty of reasons why you might want to buy the Xbox One X anyway, in preference to Sony’s PS4 Pro. Before I get onto that, though, let me first outline the console’s key features. The Xbox One X is Microsoft’s first proper 4K games console. It will sit alongside the Xbox One S, which also has a 4K Blu-ray drive for UHD movie playback, but can only play games at 1080p resolution. In terms of the UI and what you can do with the console, the Microsoft Xbox One X is pretty much identical to the One S; yes, it looks a little different, but switch it on and you’ll forget all about that. The key difference is more power under the hood, plus support for gaming at 4K and HDR, which means sharper graphics, frame rates and a richer colour palette. 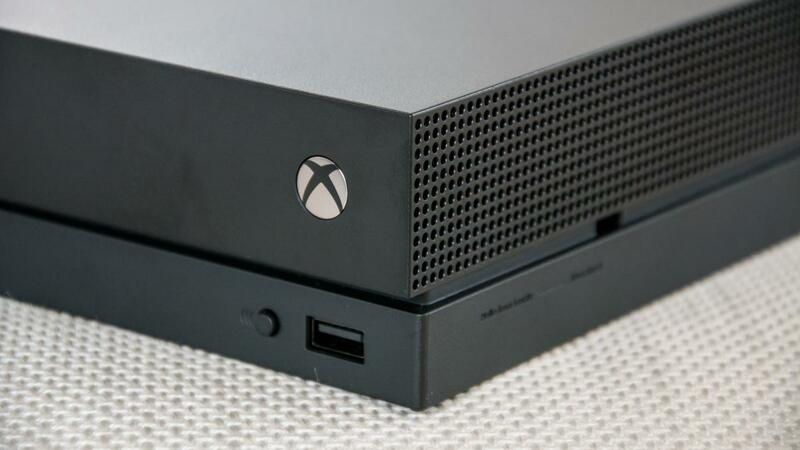 To enable all that, there’s more power squeezed inside the Xbox One X than any other games console around, with a quoted 6TFLOPS of computing power – compared with the PS4 Pro’s 4.2TFLOPS – 12GB of GDDR5 RAM with 326MB/sec of bandwidth, 8GB of flash storage plus a 1TB internal hard disk. It’s hardly surprising to find that the Xbox One X is pricey, but the fact that it costs £450, which is £100 more than the Sony PS4 Pro, could very well prove its undoing. Sony’s effort doesn’t have a 4K Blu-ray drive or offer true 4K gaming but its chequerboard technique does ensure enhanced titles still look great. 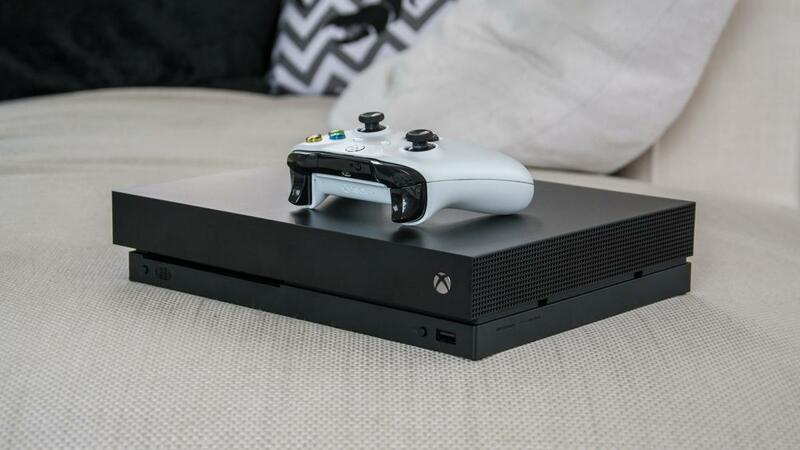 The Xbox One X’s main competition comes from within, in the form of the Xbox One S. That console is less than half the price of the One X and there are some pretty tasty bundle deals around at the moment as well, especially in the run-up to Black Friday. The One S is compatible with all the same titles as the One X and is a capable console in its own right. Even though it can “only” play games in 1080p, it has support for HDR gaming with some enhanced titles and there’s still a 4K Blu-ray drive built in, so you can at least watch your favourite movies in ultra-high definition. The Xbox One X is a masterpiece of design. It doesn’t look flashy or even particularly exciting, but it’s compact – around the same size as the One S – it’s quiet and has all the connectivity you’d expect. 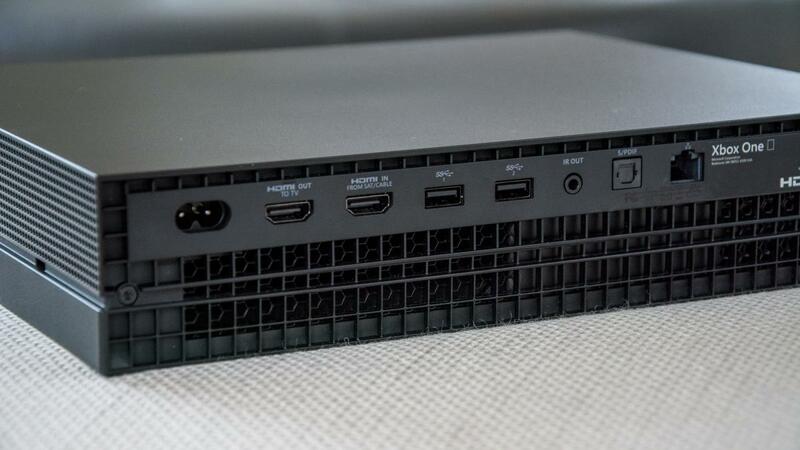 The front and left side is stepped with a short overhang obscuring the Blu-ray drive slot on the left side, there’s a front-mounted USB 3 socket and two further on the rear, plus a pair of HDMI sockets – one is for connecting your set-top box; while the other is an HDMI 2.0 output for connecting the console to your TV. The optical S/PDIF port makes another appearance, which gives plenty of flexibility to those preferring that type of output, or who have a wireless headphone like the Steelseries Siberia 800 connected. The box itself supports HDR10, which is the most common form of HDR. It would have been nice to have Dolby Vision as well, which supports higher peak brightness and dynamic range than HDR10, but for now the Xbox One X covers most of the HDR-enabled TV’s on the market. Assuming you have a compatible TV, like the Samsung UE65KS9500 I tested the Xbox One X with, you’ll see both richer colours and brighter specular highlights. Microsoft also promotes the console’s ability to support Dolby Atmos on its website, which is very much a GOOD THING. It’s worth underlining, though, that this is not only for 4K Blu-rays and streamed TV and movie content, but also those enhanced games (more on that later). One thing the Xbox One X doesn’t bring is any kind of improvement on the controller front; in fact, you get exactly the same Bluetooth-enabled controller in the box as comes with the Xbox One S. It’s a great controller, but it would have been nice to see some features trickling down from the Xbox Elite controller, such as rear-mounted paddles or a rechargeable battery pack as standard. And, no, it’s not good enough to offer users a measly £20 discount on the Elite controller if ordered with an Xbox One X. We want shiny new things, Microsoft. And so to the elephant in the room: 4K games, how they look and how they play. The answer to the second part of that question is “exceptionally”. 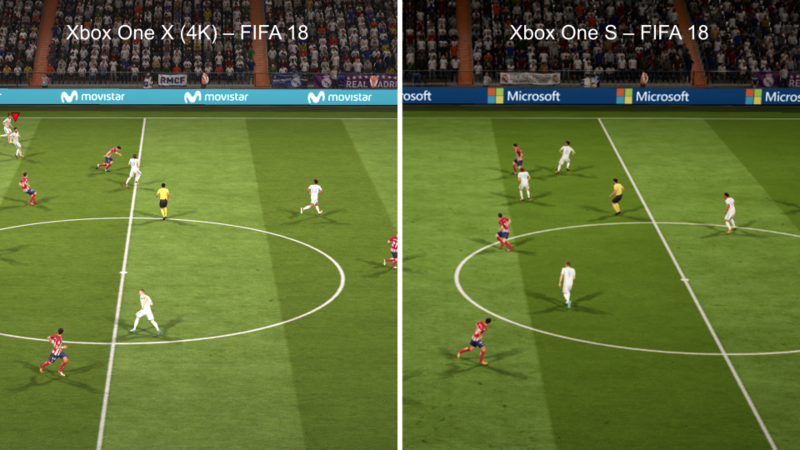 Play Gears of War 4, Super Lucky’s Tale, Forza Motorsport 7 or FIFA 18 side by side with the same titles on a One S and the differences are obvious. Before I go on, though, it’s important to note that not all enhanced games will run in native 4K. Some will run with checkerboarding like the PS4 Pro and some will offer enhanced frame rates while others will use the power of the new console to offer dynamic resolution, increased texture detail and higher polygon counts. Some, of course, will do all of these things and look stunning – the point is, not all will. In the end, it’s up to the developer to decide how to optimise for the One X, but all the games I’ve installed so far play more smoothly, look more colourful and pack cleaner, crisper and sharper visuals across the board on the One X. When you go back to the same games on the One S you’ll wonder where all the detail went and you’ll certainly notice the frame rates are less smooth. 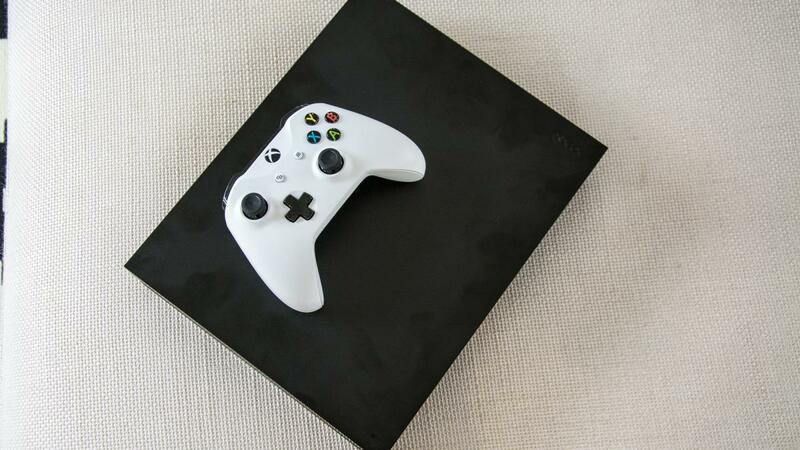 As far as Blu-ray video content goes, it looks just as good as it ever did on the Xbox One S with settings for 8-bit, 10-bit and 12-bit output, depending on what your TV supports. As with all 4K content, however, there is a catch. And that is that is that, although the smoother gameplay and colours are obvious from any distance, as soon as you sit a reasonable distance away from your TV the extra detail that 4K brings just fades away. Everything looks great sitting in my Ikea armchair a metre away from my 55in Hisense M7000, but as soon as I go to sit on the sofa and play, those differences become less apparent. The other issue for Microsoft is that the number of fully 4K-optimised games available at launch isn’t all that great. At launch, Microsoft’s first-party games support is fronted by Forza Motorsport 7, which it has to be said, does look utterly gorgeous, but the rest of the first-party 4K titles leave a little to be desired, with only Disneyland Adventures, Rush: A Disney-Pixar Adventure, Zoo Tycoon Ultimate Animal Collection, Super Lucky’s Tale, Killer Instinct, Gears of War 4, Halo 5 Guardians, Halo 3 and Halo Wars 2 among the list. On the third-party front, only a light scattering of AAA titles is ready for day one. FIFA 18 is the headliner here, and it stars alongside Assassin’s Creed Origins, Call of Duty: WWII in 4K and Rise of the Tomb Raider. And, it must be noted that that the same was true of Sony’s 4K library when the PS4 Pro launched but Sony does have a year’s head start, so there’s a much larger current selection of games than is available for the Xbox One X right now. Still, as more developers begin to release patches for existing games, the landscape should change soon; in fact we expect as the console goes on sale from midnight on 7 November a whole slew of games should become available. And, since Microsoft states there are 130 titles confirmed as “Xbox One X Enhanced”, there will be plenty available to play by Christmas 2017 and throughout 2018. That brings us to the question, should you buy the Xbox One X? The answer at this early stage is, well, maybe. It all boils down to what you have right now, whether you’re desperate for 4K games and whether you’re up for spending this much on a games console that doesn’t offer a huge amount extra over and above a console costing half as much. If you’re an Xbox devotee and already own a One, then it’s a tempting proposition. Not only do you get 4K gaming, but you also get a Blu-ray player that’s as good as most dedicated decks the same price. If you have no investment in Microsoft’s platform, it’s much less clear-cut. Yes, if you want 4K Blu-ray playback and 4K gaming, the One X is the way to go. It’s certainly cheaper than paying for a PS4 Pro and a Blu-ray player separately. But if games are your focus, the larger 4K-enabled games library and lower price of the PS4 Pro would be the way to go. As ever, your final decision should really rest on the games you want to play. If you’re a big fan of Forza, Halo or Gears of War then, by all means, buy an Xbox One X. It’s a great piece of hardware and 4K games look great on it. Everyone else, however, should opt for the PS4 Pro or perhaps, for a complete change of pace, the Nintendo Switch.